Tagged Bukit Melawati, Crab-eating monkeys, Environment, Kuala Selangor Nature Park, Long-tailed macaques, Maichal Isthyben, Malaysian Nature Society, Mangrove forest, Monkeys. 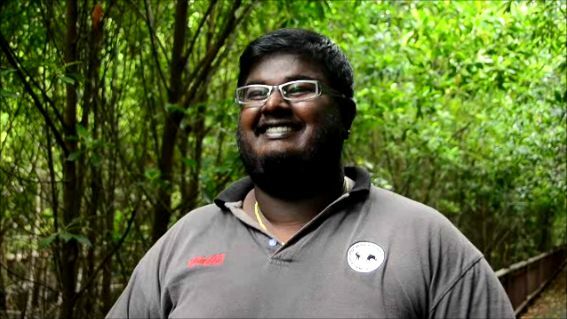 According to Maichal Isthyben, 27, park manager of the Kuala Selangor Nature Park (KSNP), there is a species of monkeys at the nature reserve called the crab-eating monkey. As Maichal pointed out to us when a group of these monkeys came by during our tour through the park’s secondary and mangrove forests, some of them have tails, and some don’t – that’s because they use their tails to bait crabs in the water. And unfortunately, some of the crabs have much larger pincers. Kuala Selangor Nature Park manager Maichal Isthyben gave the BRATs a tour through the reserve's secondary and mangrove forests. Even more unfortunate, however, is that these monkeys are in danger of having their natural behavioural patterns adversely affected by humans. 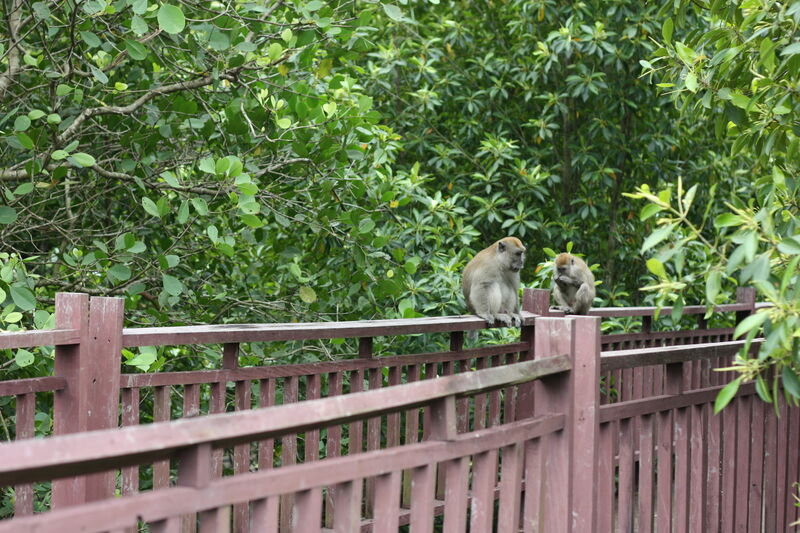 With more and more humans encroaching on their natural habitat, the monkeys are venturing out of the park more regularly, becoming a regular sight around Kuala Selangor town and especially at Bukit Melawati, which is famous among tourists and visitors for monkey feeding. “When you feed monkeys human food, they experience changes in their behaviour, some even turn more aggressive when demanding for food,” Maichal said. The behavioural patterns of the monkeys at the park have changed over the years due to human encroachment on their natural habitat. And it’s not just the monkeys who are in danger. The number of butterflies, otters, fireflies, monitor lizards, snails and various insects in the park have also started to go down, he said. The most alarming decrease is in the number of birds, both local and migratory. And birds, says Maichal, are an important biological indicator of a city’s pollution levels. This mangrove forest at KSNP was rehabilitated by the Malaysian Nature Society in collaboration with the Selangor State Government in 1987. Maichal said the land was particularly suited to become a bird sanctuary. The eagles were a particularly aawe-inspiring sight. The park’s tourist path first passes through a secondary forest that was once a mangrove. The sea level, according to Maichal, used to be much further inland. Visitors to Kuala Selangor will notice that the city’s famous lighthouse on Bukit Melawati is quite a distance from the sea, but that was where the sea used to be. 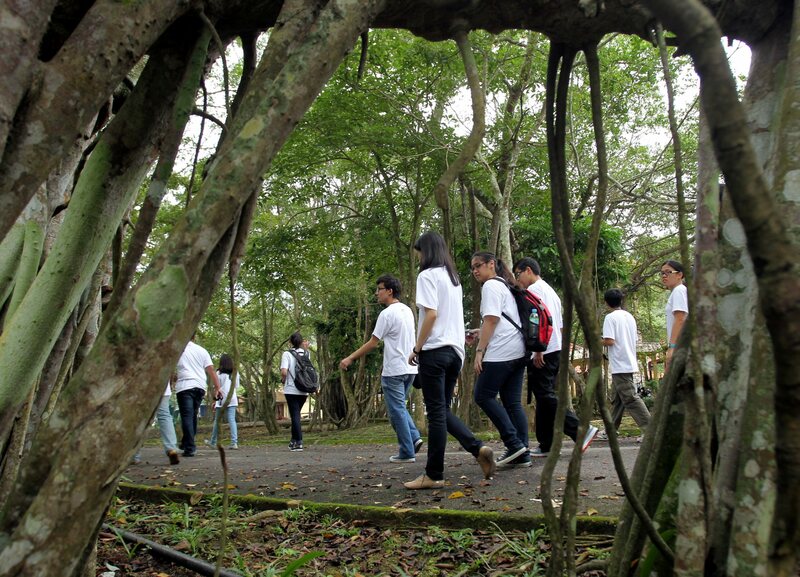 The BRATs walking through the park's secondary forest on their way to the mangroves. Although evidence of the original mangrove forest is almost completely gone, ficus trees have grown in their place, and a completely new habitat, one being closely monitored and preserved by KSNP, is thriving. “The monkeys are also helping, they bring durians from the town to eat and throw the seeds here,” added Maichal. The long-tailed macaques bring new hope to the nature park. Maichal says the pregnancy rate among the long-tailed macaques is steadily increasing, and the balance of the ecosystem continues to be well maintained. One of the reasons, is because KSNP is conservation-oriented, not tourism-oriented. When the land was given to them by the Selangor Government, the Malaysian Nature Society decided to only open 30% of it for visitors. The other 70% was to be conserved exactly the way it was. And that’s where the most important change in environmental conservation can take place – in the people’s mentality towards conservation.